Our SCR Emulator purpose and goal - is to give opportunity to lower cost of a repair to owner of a Mercedes. 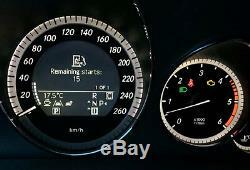 BlueTec car, equipped with modern SCR system with AdBlue injection, when SCR system has a permanent fault. 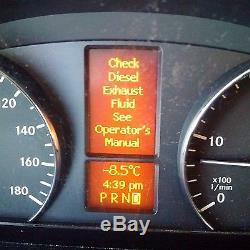 On Mercedes cars any permanent fault in SCR system makes car limited mileage or number of possible. After that mileage of motor starts owner will be NOT able to start motor anymore. BlueTec owners very angry, especially when owners located far from nearest Daimler service garage. Making them go to dealer garage several times a months. Our SCR emulator car replace SCR module as well as NOx sensors when one or more system components. Are faulty and SCR module limiting car operation. Installation of our SCR Emu takes 30 minutes. All you need to do is disconnect SCR plug and splice 4. Wires (or 7 wires) to SCR wiring loom close to plug. SCR module is easy accessible on all cars from a. Device assembled on very small PCB with size of 12x24mm (about SIM card size - see picture). Operating range is -40 + 85 degrees Celsius. Voltage range is 5.0 - 18.0V. In a sleep mode electrical current consumption. Device is really tiny and can be invisibly interweave to original car wiring looms. Devices passed two 12 hours reliability tests (80 on/off cycles) under full load at vibration bench at. 20C (-4F) and +60C (140F). SCR Emu starts to operate right after you will turn ignition on (same as SCR module) and provides all. Necessary signals to engine control module. ECM think, that SCR is present and operates normally. Under client wish it is possible to make SCR Emu power (red wire) connected via switch - this will. Make possible to switch between EMU and normal (real) SCR operation. Deactivate real SCR as many times as you wish - no settings and tuning necessary in that case. Bypass emulates both SCR module as well as two NOx sensors. SCR EMU automatically detects NOx. 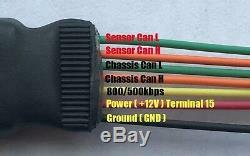 Sensors on a Can-bus and in case, that NOx are present will emulate only SCR. Detects, that NOx sensors are not present - starts to emulate both SCR and two NOx sensors. IMPORTANT: EMU can not emulate only NOx sensors without SCR. SCR module have to be. Disconnected from a car to use EMU. EMU is compatible with all Mercedes BLUETEC cars and vans (but not trucks) with SCRCM. Module (datacard code U42) and SCRCM3 (datacard code U77). E-Class W212 as of 03.2009. ML164 W164 07/2008 - 09/2011. GL164 X164 07/2008 - 09/2011. ML166 W166 as of 09.2011. GL166 X166 as of 09.2011. R251 W251 07/2008 - EOL. G463 W463 as of 06/12. Mercedes W906 Sprinter 6Cy AdBlue Bypass Module - YouTube. Video will open in a new window. Mercedes x204 GLK AdBlue Bypass Module - YouTube. Mercedes W906 Sprinter 4Cy AdBlue Bypass Module - YouTube. 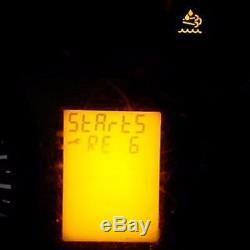 Mercedes W164 2009 GL Adblue Bypass - YouTube. Mercedes W166 ML AdBlue Bypass Module - YouTube. Q: Will i get instruction on how to install bypass? Q: Do I still need to refill AdBlue after bypass installation. A: No, all SCR system will be unpowered and no real AdBlue liquid will be injected to the exhaust. Q: Do I need to physically remove SCR catalyst. A: No - this is totally not necessary. Q: What about possible SCR clogging with long-term use with no AdBlue. A: NOx is a clear gas, clogging is absolutely not possible even in theory. Q: Do I need to remove DPF as well. A: No, the DPF and the SCR are totally independent, after bypass installation you will still have DPF regen. Cycles and DPF will continue to work at factory settings. Q: How long system can work with no AdBlue. Q: What if dealer will connect their diagnostic equipment. Will they see any difference? A: No this is hardly possible, as all diagnostics data simulated as well, all real-time data, all possible tests will. Even FW update of simulated SCR control unit and SCN coding is possible from dealer equipment. Please note that we only offer BYPASS solutions for Off-Road Usage only. Please check your country law before purchasing. It is still your responsibility to control your emissions. The item "SCR(AdBlue) NOx sensors bypass module 6wire for Mercedes BlueTec cars and vans" is in sale since Sunday, March 26, 2017. This item is in the category "eBay Motors\Parts & Accessories\In-Car Technology, GPS & Security\In-Car Entertainment\Other In-Car Entertainment". The seller is "charlesncharge0" and is located in Nepean, ON.